Leading scorer Andre Gray declared that nothing would be won or lost in the Championship clash with leaders Hull City. That may be the case, but Sam Vokes's winner against the Tigers at Turf Moor coupled with results elsewhere in the division has certainly transformed the complexion of England's second tier. The Welshman's 76th minute strike proved the difference as Burnley's red hot form continued on an excruciatingly cold afternoon in East Lancashire while Boro, Derby County and Ipswich Town all failed to win. The result pushed Sean Dyche's side back in to third, closing the gap on their opponent's to a solitary point at the summit. And it's an upturn in form against clubs in and around them in the table that could prove pivotal. The first half of the campaign saw the Clarets win just three games against the division's top 17. Now they've bypassed Brentford, the Rams and the Tigers while taking a point against Sheffield Wednesday. The two sides top the Championship's goalscoring charts and possess the most lethal strikers in the division, but neither could find the breakthrough before the interval. 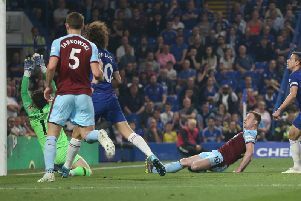 The Clarets had the first sight of goal when Allan McGregor kept out Ben Mee's header at his near post from David Jones's corner before Vokes's rebound was deflected over the bar. And when the resulting set-piece was cleared, with the ball recycled back out to the left hand side, former Tiger George Boyd did well to beat Moses Odubajo at the bye-line but his delivery was headed over the top by Vokes. Both outfits were well organised, with both restricted through the middle, leaving the flanks as the only route to get in behind. That almost paid off for the visitors when Andy Robertson's exceptional cross evaded Abel Hernandez in the penalty area while Robert Snodgrass's header back across goal was cleared. Hernandez, a £9m signing from Palermo in September 2014, did well to get a shot away when tightly monitored by Mee and Michael Keane from McGregor's clearance, but his attempt flashed comfortably wide. On the quarter-of-an-hour mark, after referee Graham Scott ignored penalty claims as Boyd went down under the challenge of Jake Livermore, Robertson sprung the counter but City's Uruguayan striker Hernandez, with 15 goals this term, dragged his left-footed shot wide of the far post. The Clarets, meanwhile, were looking threatening from set-pieces and Vokes went close when stealing a yard from Tigers skipper Michael Dawson to meet Jones's corner but the Welshman glanced his header wide. A midfield battle ensued, both keepers left unexposed, until Joey Barton's free-kick from 30-yards out was turned away by McGregor once the ball slipped up off the surface. Then, within a minute, Tom Heaton beat away Snodgrass's stinging volley after the winger was picked out by Hernandez's clever flick. The home side probed again and, failing to break their opponents down, Barton hoisted the ball in to the box, Vokes again got the better of Dawson, but the striker fired in to the turf and the ball looped over the crossbar. And in the final action of the half Lowton's percentage pass in to the mixer eventually fell for Michael Keane but the defender's header squirmed wide of the upright. After the interval it was City who enjoyed the bulk of possession but they couldn't break down Burnley's door. Odubajo stepped past Arfield on to his left boot and fired a thunderous drive at goal, but Heaton sprung to his left to touch the ball to safety. The England international was then alert enough to foil Hernandez at the striker's feet after he cut past Keane from Snodgrass's path to force a route at goal. It was a busy spell for the Turf Moor skipper and he was forced to take the ball off Hernandez's toes when slipping from Stephen Ward's back pass. Jake Livermore rifled wide from distance before Hernandez threw himself at Sam Clucas's delivery to head over from close range having found space between Mee and Ward. But City were eventually made to pay for their profligacy. Arfield's cross from the left was only partially cleared, McGregor spilled Barton's shot from the edge of the box, and Vokes wrapped his right foot around the ball to tuck it home at the near post. Vokes had the chance to double the advantage when Gray's effort was deflected in to his path but the striker was booked for simulation having gone to ground when attempting to round McGregor.